One issue has provoked a 160,000-strong petition, an impassioned letter to prime minister David Cameron and a march to the heart of government: the proposals to axe the student bursary. On the eve of the deadline for the government consultation, the anger felt across the profession about plans to cut the funding for nursing students shows no sign of waning. In one of the last demonstrations before the deadline on 30 June, dozens of students took to the stage during a debate on the issue at this month’s RCN congress in Glasgow. Kathryn Davies, an RCN student committee member and final-year nursing student at the University of Surrey, spoke on their behalf. ‘Under the proposed scheme it would take me 100 years to pay back my loan as a band 5,’ she said. The government’s consultation on the proposals were revealed by chancellor George Osborne in the spending review last November. The Department of Health insists the move will fund up to 10,000 more training places by 2020 and provide students with about 25% more financial support. But research from Unison and the National Union of Students warns the plans could cost the NHS 2,000 recruits a year if students are deterred by loans. The RCN was collating its response to the consultation as Nursing Standard went to press. But the results of a 17,000-strong survey by the college published last month revealed two thirds of respondents would not have joined the profession had the bursary not been available. 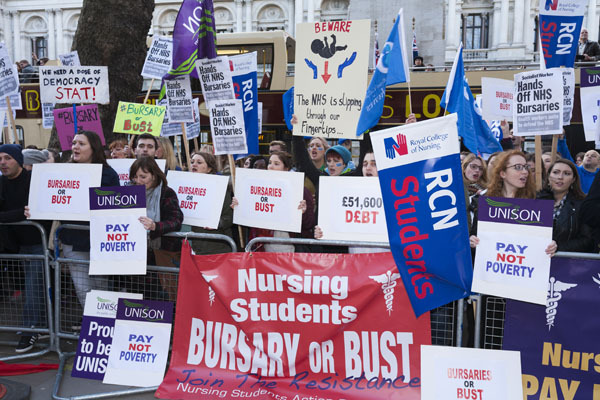 ‘College members have joined marches, met with MPs and used social media to put pressure on the government,’ RCN general secretary Janet Davies told RCN congress. More than 3,000 Unison members have had their say as part of Unison’s response to the consultation through online surveys and engagement events. Another form of opposition has been a petition by Staffordshire University nursing student Kat Webb, which gathered 162,000 signatures and triggered a debate in parliament. And there have been numerous demonstrations across England, including a ‘save the bursary’ rally at Westminster in May. One of the main concerns for RCN and Unison members is the number of registered nurses needed to mentor growing numbers of students. The RCN survey found 81% of respondents do not believe registered nurses have the capacity to mentor more students, while Ms Adams says the issue worries many of those who responded to the Unison surveys. First minister for Scotland Nicola Sturgeon has also spoken out on the bursary plans. In a keynote speech to RCN congress, she said the bursary would remain in Scotland, calling the Westminster proposals ‘short-sighted’. Last week, the RCN led a coalition of more than 20 healthcare organisations, including the Royal College of General Practitioners and the British Medical Association, in an open letter to Mr Cameron urging him to halt the plans.